Video marketing has long been a successful strategy to capture an audience for multiple purposes, including brand awareness and purchase conversions. More recently, live streaming has become popular among brands of all sizes and industries. In November 2016, Forbes even posted a list of different brands that use live Video for marketing. A few years ago, most live video was reserved for large companies helping a limited number of channels with beta testing. Now, live video is available to both personal and business users, and at nearly zero cost. The attention that digital media channels are giving live streams isn’t something to balk at, and if your marketing team hasn’t acted on this, time is running out. From social media channels like Facebook and Instagram, to video-only resources like Twitch and Vimeo, live streams are widespread. In a medium once commanded by YouTube, live video is no longer restricted to any single channel. Going live with your product or offering has gone from making a decision to include it in your budget, to deciding which channels would be included. You can even check out simple guides to video content marketing to help you get started with this newer form of branding. So who’s found success live streaming? Nissan found out first hand how new product introductions can be a great time to live stream during the launch of the 2016 Maxima at the New York auto show. 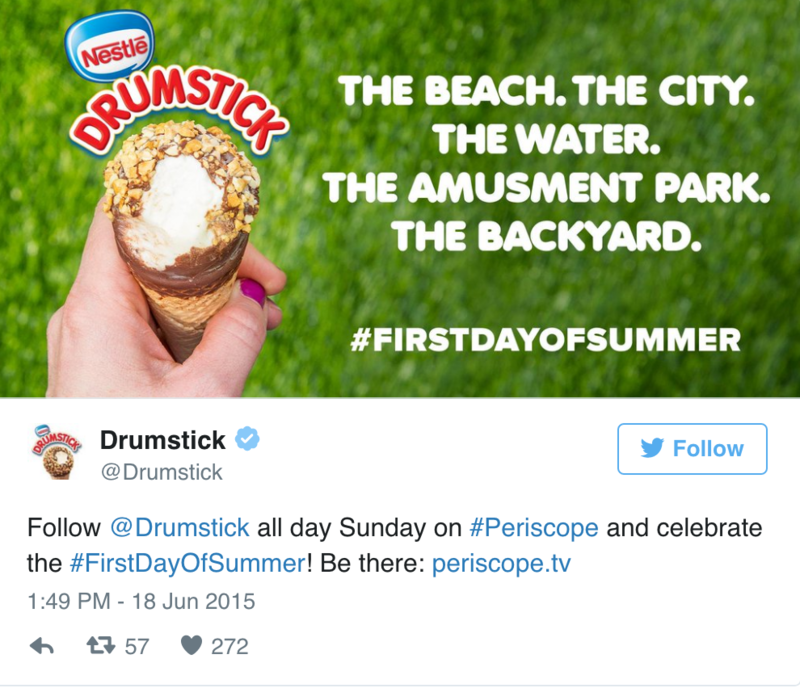 Nestle Drumstick ran a sponsored live stream campaign using Periscope influencers a few years back for their #FirstDayOfSummer campaign. 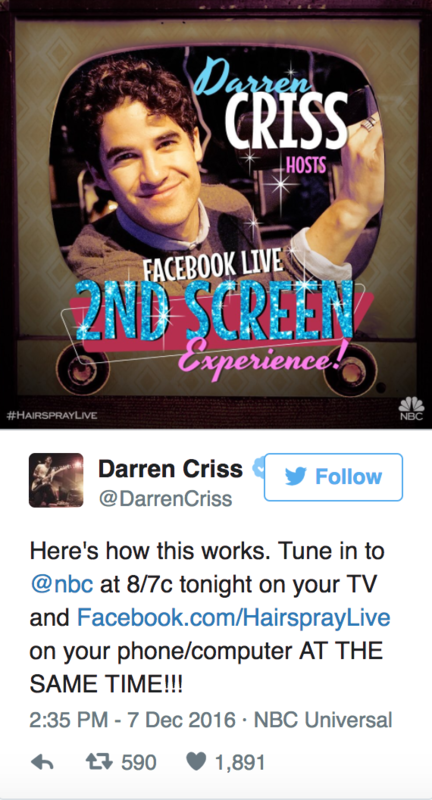 Last December, NBC Entertainment Marketing and Digital Media Management designed an influencer campaign for the broadcasting of Hairspray Live. The campaign partnered with 20 different influencers, some of who were responsible for hosting the Hairspray Live! Facebook live and others were included on the VIP platform to create additional content and buzz for the show. And that was just the onsite participation…NBC also sent out Hairspray Live! viewing kits to influencers nation wide and asked them to promote using #HairsprayLive on their own channels. 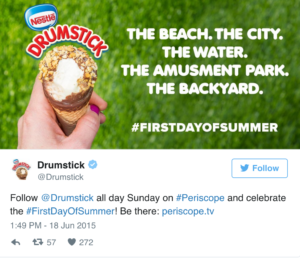 Advertising a live stream can generate an additional influx of brand awareness. Using paid ads like Twitch Banners or Facebook Ads that link direct to your live stream offers exposure that is strongest in your minutes or hours of live stream. Performance tracking has seen significant improvement over the last several months, allowing you to make adjustments to your next live stream campaign without having to wait days or weeks for data. The software and hardware that was once required to perform a live stream could have sent any marketing budget well into the red. Today, stream hosting is offered by nearly every major channel that marketers use to reach their target audience. Software is not only affordable, but in many cases, open source (free). Additionally, users can now stream right from their computers, tablets, and smartphones, letting you go live wherever and whenever you feel is valuable to your marketing strategy. In the digital world, competition equals noise. Cutting through the noise is the goal of any efficient marketing team. By offering live video for new products, ideas, or even seasonal promotions, there is the opportunity to capture attention. In most cases, users can’t watch any two videos at the same time. Make one that’s creative enough and you’ll be able to spread the word about your offering in a viral way. The most important use of live-streaming for marketing teams is that this solution is “right now”. Social media channels are pushing live streams to the top of users’ feeds. In many cases, users are notified as much as 200% more often about live streams than any other activity within their social media stream. Acting on this kind of interaction rather than just developing a marketing plan for it is the first step in being successful. As with all marketing channels, there will always be a “next big thing”, and live streams will no longer be the business driver that they are today.